Ulysses S Grant, besides being the General-in-Chief of the Union armies at the time of the Union victory in the American Civil War, was also President, 1869-78, at a time when the United States was undergoing significant transformations, both economically and strategically, and growing in confidence as a world power. At the same time Japan, following the Meiji Restoration of 1868, was seeking to join the ranks of the developed, read exclusively western, states. 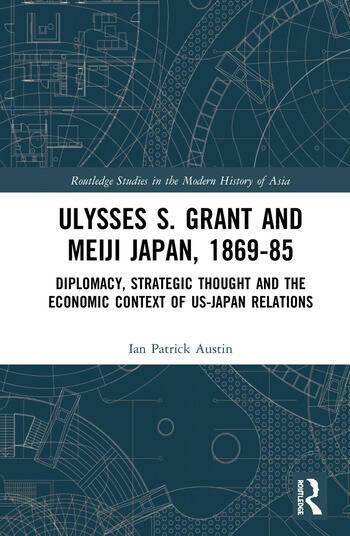 This book explores the interaction of Grant with Meiji Japan, compares and contrasts developments in the two countries and assesses the impact each country had on the other. It discusses the travels of the Iwakura Mission in the United States, considers Grant’s 1879 visit to Japan and examines the personal relationship between Grant, the Meiji emperor and the other leaders of the Meiji government. The book argues that Grant’s thoughtful consideration of the key issues of the day, issues common to many countries at the time, and his suggested policy responses had a huge impact on Meiji Japan. Ian Patrick Austin is a Senior Lecturer in International Business at Edith Cowan University, Western Australia.